Kathryn Anne Edwards, Economic Policy Institute, on the panel at the NASI Conference. David Baldridge, International Association of Indigenous Aging, in background. Photo by Sam Kittner/kittner.com for NASI. Last week was the 24th annual conference of the National Academy of Social Insurance held at the National Press Club in Washington, DC. At a roundtable session on Friday, January 27, panelists discussed how to craft effective messaging on Social Security to reach different audiences—including young people, as well as those from diverse ethnic and racial groups. Covering all American workers and their families, Social Security has an enormous reach. This accounts for the both the program’s success, as well as the difficulty in communicating its importance to all those who will likely receive Social Security benefits at some point. Panelist Wilhelmina A. Leigh, Senior Research Associate on Economic Security with the Joint Center for Political and Economic Studies, served as a member of the Commission to Modernize Social Security. She emphasized the importance of communicating that the program could be improved both to restore solvency and enhance benefits, which was a goal of the commission. The challenge of communicating Social Security is reaching those who have not yet had to apply for benefits. “People who have gotten the message about how the system works have generally had to use the system,” said Leigh. David Baldridge spoke on the panel as Executive Director of the International Association of Indigenous Aging (IA 2), an organization that received NASI grant funding in order to conduct outreach and education on Social Security among Indian elders in New Mexico. Baldridge explained that it was imperative to get support from Indian elders in order to engage tribes living in more isolated communities and reservations. Listening to and incorporating recommendations on Social Security from members of the community was also essential. The effort proved to be a success, eventually leading to the buy-in of more than 500 tribes for the report that included formal recommendations based on the tribes’ own input. The process is intended to serve as a national model for engaging indigenous tribes across the country on these issues. Valerie Rawlston Wilson, Vice President of Research and Economist with the National Urban League Policy Institute, faces several main challenges in communicating the importance of Social Security to the African American community: reaching a diverse audience, capturing people’s attention, simplifying a complex issue, and obtaining buy-in from local affiliate leaders. To reach a younger audience, Wilson relies on social media and the Urban League’s “I am Empowered” campaign. The website for the campaign includes an easy-to-follow quiz to test users knowledge of the Social Security program. Leigh added that scenario-based exercises can help young adults think about ways that Social Security benefits could actually help them down the road, if they lost a job or a spouse. 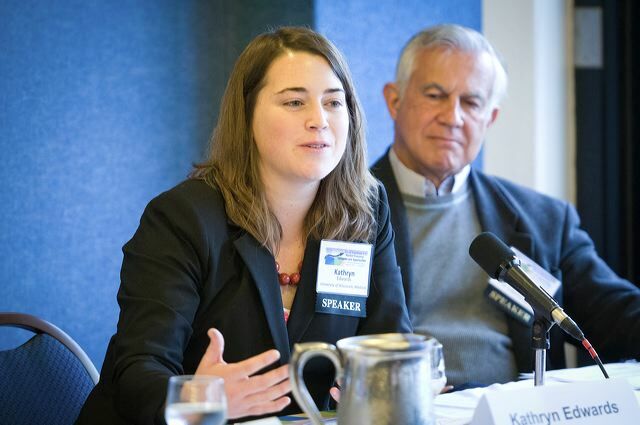 Kathryn Anne Edwards, Research Assistant with the Economic Policy Institute (EPI), also aims to reach young people with the message of preserving Social Security. In this case, she is reaching out to her peers. Edwards, who is in her twenties, wrote a textbook on Social Security directed to her own generation that defines Social Security, outlines its benefits, and offers a perspective in support of the program. Edwards found young people might not understand why they need to support Social Security. They may feel helpless believing simply that the program will be gone by the time they retire. Her response is that it is a matter of responsibility and young people are not as forsaken as they perceive themselves to be. “If you are under 30, Social Security is yours to lose,” said Edwards. As one of NASI’s grantees charged with conducting outreach and education on Social Security, IWPR is working to communicate the importance of the program. Our research has shown that reliance on the program increased among older Americans in the past decade and that it is widely supported across lines of gender, race/ethnicity, and political affiliation. IWPR continues to work closely with the National Council of Women’s Organizations to conduct outreach on the importance of Social Security to Americans, particularly vulnerable populations such as low-income seniors.